July 13, 2017 – The launch of the first Joint Polar Satellite System (JPSS-1) has been postponed to a date no earlier than October 12, 2017. According to NOAA spokesperson John Leslie, there are some technical issues that need to be resolved before testing can be finalized. The team first discovered a reliability issue with a specific type of capacitor, used to store electrical charges, on the JPSS-1 spacecraft. The issue will require additional testing and a comprehensive assessment of the spacecraft’s vulnerability to failure due to these parts. Engineers are also assessing the status of the Advanced Technology Microwave Sounder (ATMS) instrument. During the final thermal vacuum test on JPSS-1, the test team discovered an electrical interference between the ATMS and the spacecraft. The team is working to ensure the ATMS operates properly on-orbit. The ATMS works by collecting microwave radiation from the Earth’s atmosphere and surface day and night, even through thick clouds. This is particularly valuable for forecasters because it will allow them to “see” inside and below clouds, and it can be used to produce images inside hurricanes and other storms. ATMS measurements also provide rainfall rates and snow and ice information. ATMS data will be used to forecast weather three to seven days in advance. Once all of the issues are resolved and the satellite launches, JPSS-1 will bring significant technological and scientific advances to weather, climate, environmental and oceanographic forecasting and monitoring. JPSS will provide essential data to forecast severe weather, and will aid in assessing environmental hazards such as droughts, forest fires, poor air quality and harmful coastal waters. 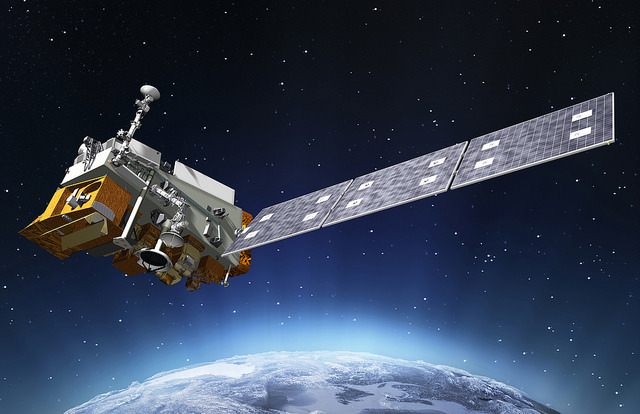 JPSS-1 will continue the collection of operational polar-orbiting weather and climate data currently provided by the NOAA/NASA Suomi National Polar-orbiting Partnership (Suomi NPP) satellite built by Ball Aerospace. On orbit since 2011, Suomi NPP, the first in the series of next-generation JPSS satellites, collects science-quality atmospheric, oceanographic, and land surface measurements that are critical for the nation’s operational weather mission. JPSS enables forecasters and scientists to monitor and predict weather patterns with greater accuracy and to study long-term climate trends by extending the more than 30-year satellite data record. JPSS-1 is also being built by Ball Aerospace in Boulder, Colorado. Ball is responsible for designing and building the JPSS-1 spacecraft, the Ozone Mapping and Profiler Suite-Nadir instrument, the integration of all instruments and for performing satellite-level testing and launch support. JPSS-1 will launch atop a United Launch Alliance (ULA) Delta II rocket from Vandenberg Air Force Base, California. The booster will fly in the 7920 configuration, which includes 9 solid rocket boosters and no third stage. NOAA is responsible for managing and operating the JPSS program, while NASA is responsible for developing and building the JPSS instruments, spacecraft, and ground system. JPSS-1 was originally scheduled to launch on January 20, 2017, and was most recently scheduled for September.